If you’ve ever been drenched with hydraulic fluid during your career in control engineering; you may have remarked on the fact that it’s ‘dirty stuff’! Upon reflection, and when the shock died down, you knew that you were just reacting to a situation and really using the words incorrectly. However, when you look more deeply into the subject of fluids, in certain instances they really can be termed dirty. As you know – you take a sample of fluid from a brand new barrel of hydraulic fluid, put it through a particle count machine and just see what readings you get. Some manufacturers and distributors will provide a service to turn ‘commercially clean’ fluid into a product with a specific cleanliness. No doubt there are instances where such a service will prove a valuable asset – but a lot of system designers take the opposite route and accept the fluid delivered for what it is ‘commercially clean’; then proceed to ‘condition’ it to whatever cleanliness level they need for their application. If you think about it… every time fluid is exposed to the atmosphere it picks up airborne particles. The same applies to any hoses, funnels, bowls, dishes etc. that it may come into contact with. In short, whatever is used to handle or transfer fluid from one place to another, is also a potential very able and willing donor of contamination of one sort or another. 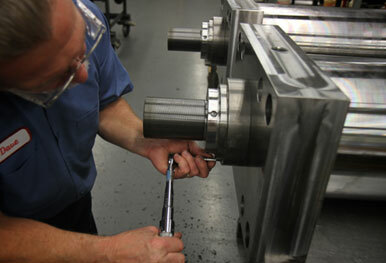 Normally, the cleanliness of the fluid in a system is going to hinge around the most sensitive component. Servo valves and such like items are typical of the items which can be jammed solid by grossly contaminated fluid – especially if any particularly large particles of debris are present and rushing around the system, waiting to find the perfect home to do most damage. Often, best company practice dictates repeatedly functioning a piece of equipment when completed - without the more sensitive items fitted – and only when fluid samples meet your minimum fluid cleanliness needs do those sensitive items get install to complete the commissioning work. Sheffer has a strict regimen in operation wherein the fluid in cylinder test rigs is continuously monitored to a cleanliness of NAS6. So, what goes into a cylinder; which in any case, has been carefully assembled from parts that have previously been individual cleaned; is just right for most customers to go ahead and use with confidence. Although you may already be aware of that... did you also know that if you need a flying start to getting your system up and running even more quickly; Sheffer has a service available wherein specific cylinders can be flushed and certified to a given cleanliness? They can also be shipped ‘drained’ or ‘filled’. The choice is yours. If a discussion on fluid is something which interests you – then ask your contact at Sheffer; you might be surprised how much it helps your throughput. Fill out a Contact Us form -- or give us a call 1 (513) 489-9770.